After another night of snow showers today is yet another Snow Day. I have been to work this week, honest! This inturn lead to a slight Nutella crisis. Today is officially World Nutella Day and it is paramount I eat Nutella on this important day. 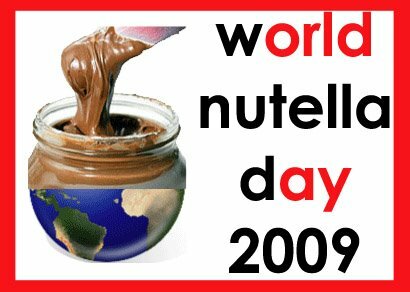 World Nutella Day this year is being hosted by Sarah from Ms. Adventures in Italy and Michelle from Bleeding Espresso. Now, usually I have always have jar of the sweet chocolatiness in the cupboard for those spoon-straight-in-the-jar emergencies but after making Nutella & Peanut Butter Brownies for Hubby’s workmates I forgot to pick up a jar. Snowed in and a 2 hour walk for Nutella I decided to see if it is possible to make Nutella from scratch. Lo and behold Su Good Sweets came to my rescue. Now, the major difference between Nutella and my version was that I didn’t have any hazelnuts in, so instead used cashew nuts and almonds. I also used rapeseed oil as it has a pleasant nutty taste. Although I think I may have nearly killed my food processor in the making of this nutty chocolate butter it was worth it. It’s not quite a smooth as tradition Nutella, but just as delicious. It was interesting watching the nuts turn from the whole nuts into a paste. My home-made Nutella certainly helped the with Nutella craving that was going to go unsatisfied otherwise. I’d be interested to try it again with hazelnuts. Great to make your own, I made a hazelnut honey one once and it was quite good.